The Flygt Dewatering Division has an extensive inventory of submersible and diesel-driven pumps, generators, pipe, hose, valves, and fittings, plus all necessary hardware to tackle any bypass or dewatering project. Along with an on staff dewatering system design specialist - our competent and dedicated sales and service personnel are available to support you 24/7. 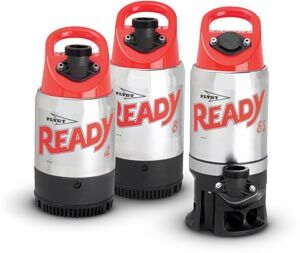 Our “next generation” abrasion resistant Flygt 2000 Series Pumps are designed for long life and reliable operation on construction sites, mines and in other industrial applications. Our 2000 Series Pumps are light weight, portable, silent, and highly efficient. Be assured: We have the pump to meet your dewatering needs!